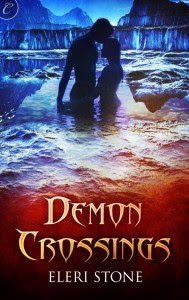 Demon Crossings was written by Eleri Stone (who is a high school friend of mine). Grace is a private investigator who rolls into the quiet town of Ragnarok, Iowa searching for a missing person. But the secluded farming community is not exactly what it seems and Grace is plunged into a world of Norse gods and fire demons where the Wild Hunt still rides the night. Instead of a quick resolution to an easy case, Grace is faced with the terrifying task of crossing between worlds to rescue a lost girl. In Ragnarok, Grace finds a family and a home. She also finds herself falling in love with the man who’s leading her into danger. This is Eleri Stone's third book. I read the first 2 last year (although I've just realized the second book is still in my list of books that haven't been listed yet for last year.... I'm so behind!!!) and thought they were pretty amazing.... so I really looked forward to what Demon Crossings would be about. I was a little disappointment at first when I saw it wasn't going to be continuation of the Lost City Shifters series. I quickly got over my disappointment. I found myself really liking Grace right away. (How can you not like a woman who gives her life to tracking down missing children?) And oh-my-goodness Aiden. Let me just say that Ms. Stone certainly knows how to write a romance hero. Um... wow! I will say one more thing about the book. It might not be something you want to read while sitting next to your first grader who is just learning to read. Or in public. I found myself sitting on the swim bleachers today next to a dad. I couldn't help but tilt my kindle away from him for fear he might glance and read over my shoulder. Yeah... quite a few of the scenes in Demon Crossings are probably meant to be read in quiet privacy. Let's just say this book is not any less hot than Eleri Stones previous 2. Ahem.